The idea of the oni first developed when Japanese literature chose a Chinese character meaning “invisible soul/spirit of the dead” to symbolize the oni and in the first Japanese dictionary, the oni was defined as, “Hiding behind things, not wishing to appear….It is a soul/spirit of the dead.” This definition indicates that the roots of the Oni lie within Chinese ideas. 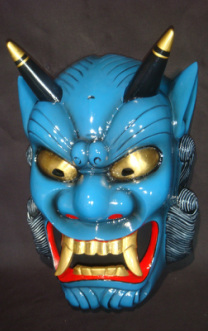 Shifting from China to the medieval period, the Oni was presented as primarily male with horns, third eyes, and multiple skin colors. Their abilities, as described by Reider, were, “To cause natural disasters and possess ordinary household objects.” He tells that the Oni was dynamic and could appear anywhere even in innocent babies creating a connotation of “awe and fear.” Reider tells us that babies born with teeth were thought to be children of the oni. As customary to Japanese culture unfortunately, any children of the oni were abused and killed. These negative aspects of the Oni raise a curiosity of why people would want that tattooed on their skin.